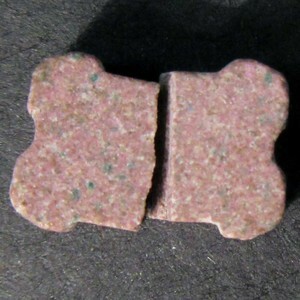 Broken Heineken-label style tablet with faint white and blue speckles. 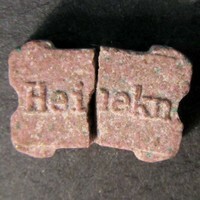 'Heinekn' (no letter e after the K) on one side, break line on reverse side. Sender notes reagent reactions conducted before sending in sample: Marquis-none (after 15 min turned slightly brown/green); Mecke-black; Mandelin-dark green/brown; Simons-no reaction; Lieberman-bright dark blue.